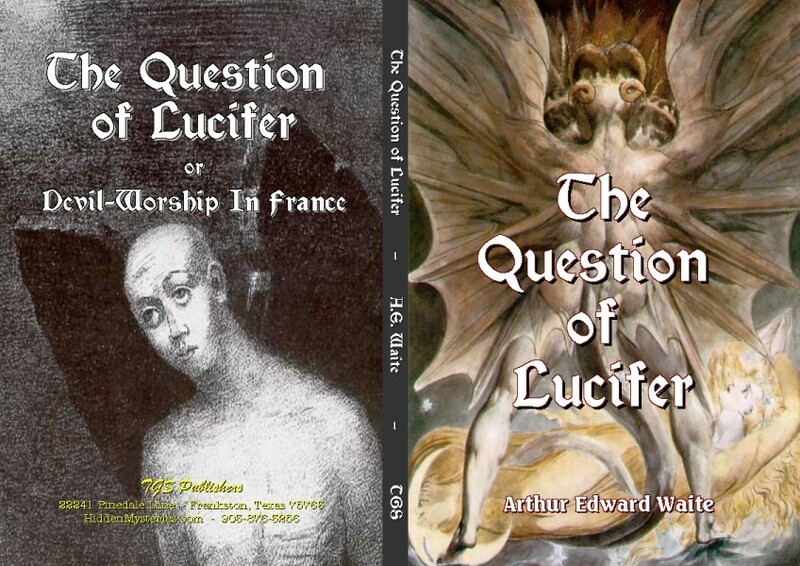 This being an in depth defense, based in facts, against the false propaganda of the Catholic Church, alleging Freemasonry is Satanic/Satan worshippers would be an over simplification of any works by Arthur Edward Waite. Waite is one of the great mystic authors and researchers from the Age of Enlightenment, when the 'church' was held up to the light of truth, and the church failed. "The first in this plot was Lucifer." Modern Diabolism exists within the pale of the Catholic Church; the entire literature is written from the standpoint of that church, and has been created solely in its interests. § 2. Why Signor Carbuccia was Damned. § 3. A Priestess of Lucifer. § 4. A House of Rottenness. § 5. The Seven Temples and a Sabbath in Sheol. § 6. A Palladian Initiation. § 8. The Great City of Lucifer. § 10. The Doctor and Diana. Chapter IX How Lucifer Is Unmasked. THE term Modern Satanism is not intended to signify the development of some new aspect of old doctrine concerning demonology, or some new argument for the personification of the evil principle in universal nature. It is intended to signify the alleged revival, or, at least, the reappearance to some extent in public, of a cultus diabolicus, or formal religion of the devil, the existence of which, in the middle ages, is registered by the known facts of the Black Sabbath, a department, however, of historical research, to which full justice yet remains to be done. By the hypothesis, such a religion may assume one of two forms; it may be a worship of the evil principle as such, namely, a conscious attempt on the part of human minds to identify themselves with that principle, or it may be the worship of a power which is regarded as evil by other religions, from which view the worshippers in question dissent. The necessity for this distinction I shall make apparent in the first chapter of this book. A religion of the darkness, subsisting under each of these distinctive forms, is said to be in practice at the present moment, and to be characterised, as it was in the past, by the strong evidence of miracles,-in other words, by transcendental phenomena of a very extraordinary kind, connecting in a direct manner with what is generically termed Black Magic. Now, Black Magic in the past may have been imposture reinforced by delusion, and to state that it is recurring at the present day does not commit anyone to an opinion upon its veridical origin. To say, also, that the existence of modern diabolism has passed from the region of rumour into that of exhaustive and detailed statement, is to record a matter of fact, and I must add that the evidence in hand, whatever its ultimate value, can be regarded lightly by those only who are unacquainted with its extent and character. This evidence is, broadly, of three kinds:-(a) The testimony of independent men of letters, who would seem to have come in contact therewith; (b) the testimony volunteered by former initiates of such secret associations as are dedicated to a cultus diabolicus; (c) the testimony of certain writers, claiming special sources of information, and defending some affected interests of the Roman Catholic Church. My purpose in this book is to distinguish, so far as may be possible, what is true from what is false in the evidence, and I have undertaken the task, firstly, because modern mystics are accused, en masse, of being concerned in this cultus; secondly, because the existence of modern Satanism has given opportunity to a conspiracy of falsehood which is wide in its ramifications, and serious on account of its source; thirdly, because the question itself has awakened considerable interest both within and without transcendental circles, and it is desirable to replace hazy and exaggerated notions by a clear and formal statement. The Great Teacher of Christianity beheld Lucifer fall from heaven like lightning, and, in a different sense, the modern world has witnessed a similar spectacle. Assuredly the demon of Milton has been cast down from the sky of theology, and, except in a few centres of extreme doctrinal concentration, there is no place found for him. The apostles of material philosophy have in a manner searched the universe, and have produced-well, the material philosophy, and therein is no question of Lucifer. At the opposite pole of thought there is, let us say, the spiritualist, in possession of many instruments superior, at least by the hypothesis, to the search-lights of science, through which he receives the messages of the spheres and establishes a partial acquaintance with an order which is not of this world; but in that order also there appears to be no question of Lucifer, though vexed questions there are without number concerning "unprogressed spirits," to say nothing of the elementary. Between these poles there is the flux and reflux of multitudinous opinions; but, except at the centres mentioned, there is still no question of Lucifer; it has been shelved or dropped. The revival of mystical philosophy, and, moreover, of transcendental experiment, which is prosecuted in secret to a far greater extent than the public can possibly be aware, has, however, set many old oracles chattering, and they are more voluble at the present moment than the great Dodonian grove. As might be expected, they whisper occasionally of deeds done in the darkness which look weird when exposed to the day. The terms Satanism, Luciferianism, Diabolism, and their equivalents, have been buzzed frequently, though with some indistinctness, of late, and in accents that indicate the existence of a living terror-people do not quite know of what kind-rather than an exploded superstition. 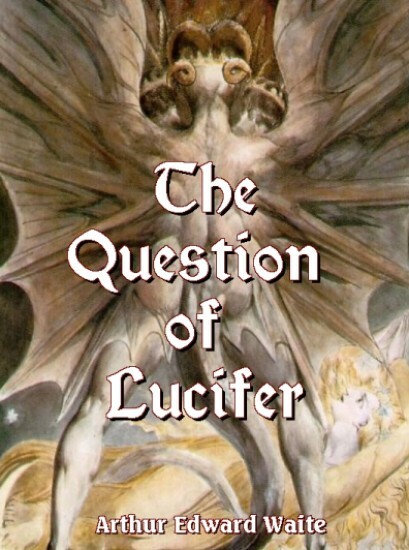 To be plain, the Question of Lucifer has reappeared, and in a manner which must be eminently disconcerting to the average intelligence and the advanced and strong in mind. It has reappeared not as a speculative inquiry into the possibility of a personal embodiment of evil operating mysteriously, but after a wholly spiritual manner, for the propagation of the second death; we are asked to acknowledge that there is a visible and tangible manifestation of the descending hierarchy taking place at the close of a century which has denied that there is any prince of darkness. Now there are some subjects which impress one at first sight as unserious, but we come to regard them differently when we find that they are being taken seriously. We have been accustomed, with some show of reason, to connect the idea of devil-worship with barbarous rites obtaining among savage nations, to regard it, in fact, as a suitable complement of the fetish. It seems hypothetically quite impossible that there can be any person, much less any society or class of persons, who, at this day, and in London, Paris, or New York, adore the evil principle.